Well it seems I'm not alone in wanting to brighten up my wardrobe, which is why online brand Very.co.uk have brought out a whole rainbow of colours for their new season Spring summer dresses and accessories. Fronted by TV personality Fearne Cotton, their new advert features hues of bright coral, classic blue, deep purple and pure sparkling white. Although the brand is aimed at young twenty and thirty year olds, judging by the advert, they seem to have catered for a whole range of styles, and with so many options to choose from there's bound to be something for everyone, whatever the occasion. In particular I'm loving the white mini dress, peach clutch bag and turquoise blue statement necklace (all 3 of which can be seen in the last few shots). For more information or to shop the collection, click here. Did any particular pieces catch your eye? What will you be updating your wardrobe with this year? me your address by 5th March I'll arrange for your prize to be send out asap. 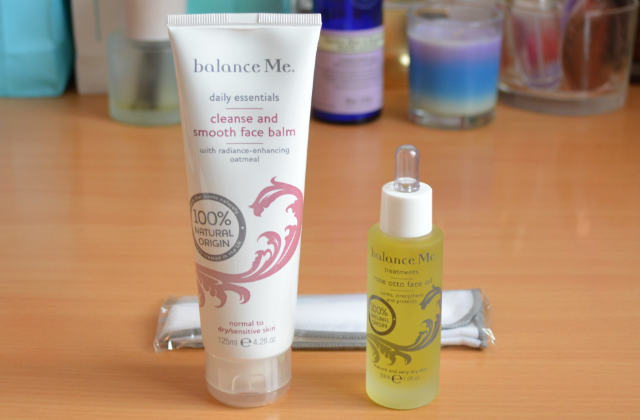 Made with 100% natural ingredients, Balance me cleanse and smooth face balm claims to gently cleanse and improve radiance, something which my dry winter skin desperately needed. Being an oil based balm, a little goes a long way and I find a large pea sized amount is enough to massage all over and remove any make up. Unlike other face balms on the market, this one has very fine bits of oatmeal blended in, which gently exfoliates as you cleanse. Not something that I'd use everyday, but great for a twice weekly exfoliation or as a pre mask treatment. It also comes with it's muslin cloth, which comes in handy when washing off any last residues. Next up we have the Rose otto face oil, which has become somewhat of a daily essential for me. Formulated with rose, oat, starflower, grape, olive and jojoba seed oils, this stuff is seriously nourishing. Being an oil it takes a while to fully sink in but never feels greasy on the skin. It comes with it's own little pipette too, which is great as you can control exactly how much product you use (there's nothing more annoying than pouring too much and having it go to waste). I find one or two drops is enough for any dry patches and occasionally I like to use four or five drops all over when I'm having a particularly bad skin day. It works wonders on dry weather beaten hands too. Have you tried either of these 2 products? What are your winter essentials? What I like about L'artisan is that their perfumes are all so unique - they've managed to capture the spirit of Paris in a bottle and no matter which fragrance I go for, it's easy to imagine myself sat in a traditional smoke filled cafe, glass of wine or coffee in hand being uber chic and watching the world go by. Designed as part of the Explosions d'emotions range, L'artisan skin on skin eau de parfum blends together notes of iris, suede, saffron, lavender and rose. As you'd expect from such a provocative name, Skin on skin is rich, smokey and seductive, with just a hint of powdery musk to add that feminine edge. At £135 a bottle it's definitely an investment purchase, although ml for ml it actually works out cheaper than some of the big name high street perfumes. For me though not only is perfume is intrinsically linked to emotion, it also has this amazing ability to transport you back and I love the idea of being able to spray this again someday in the future and be reminded of all the happy memories from this month. Have you tried anything from L'artisan? What's been your favourite perfume this month? Well I'm pleased to say they didn't disappoint. 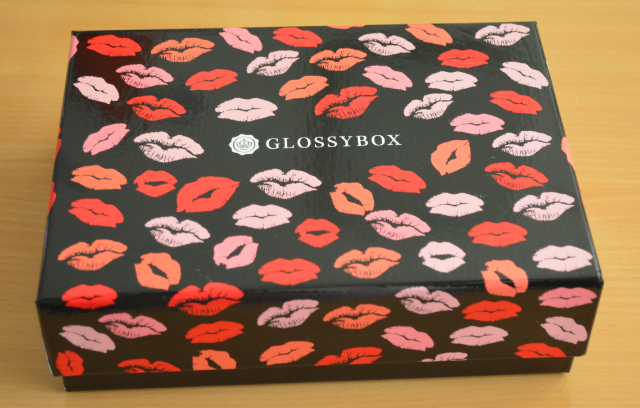 Starting with Glossybox who have gone for a cheeky romantically themed lipstick print. Now I know it's the products inside that really matters, but the limited edition designs have always been my favourite, and with surprise boxes it never hurts to make a good first impression. Product wise I think they've done really well too. There's a good mix of haircare, bodycare and make up, with a bar of Lindt chocolate thrown in for good measure too. In the past I've been disappointed with nail colours, but this month they've got it spot on with Ciate play date, a beautiful orange red that'll be perfect whatever the occasion. It's nice to see Maybelline big eyes mascara too, especially as it's such a new product and will no doubt be on many a wishlist thanks to it's extensive advertising campaign. For me Love me beauty have always focused more on content rather than design, but it's nice to see them embrace the Valentine's theme too with red tissue paper and a product information card. As always there were a choice of 3 boxes, although this month the 5th product was kept a surprise - I actually really liked the surprise element, and wouldn't mind them doing it for future boxes too. Of the 5, I was most excited about Art Deco hydra lip booster and Percy & Reed dry conditioner. As you know I love my lipglosses, and this deep red colour couldn't have been more perfect for Valentine's day. The dry conditioner sounds really interesting too. My hair is in desperate need of a haircut at the moment, and I'm hoping this'll help to keep it somewhat smooth and tangle free in between washes. 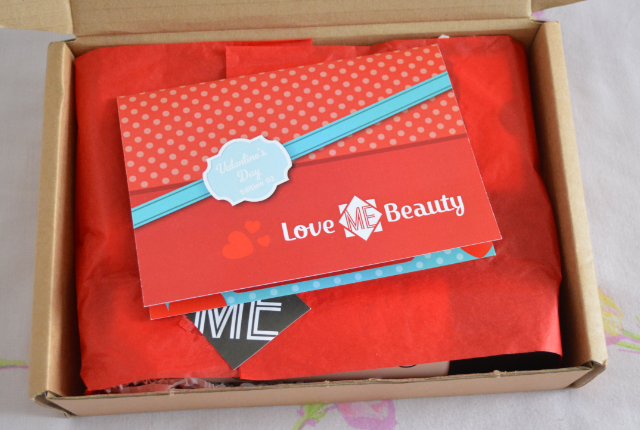 Overall, 2 really good beauty boxes this month, and I can't wait to see what they've got planned for March 2014! 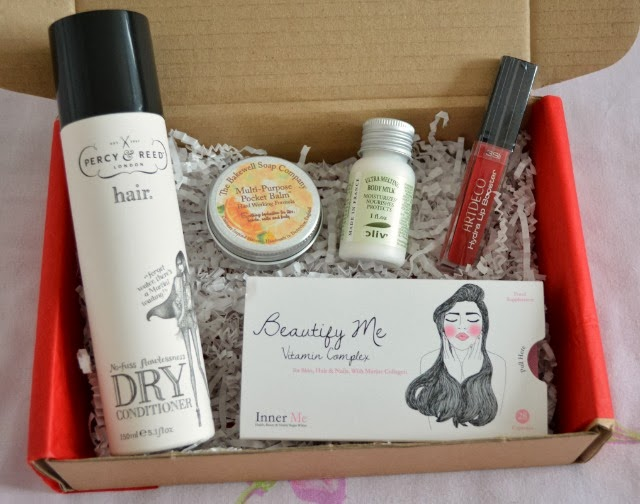 Are you a beauty box subscriber? What do you think about this month's contents? First thing to mention is the lilac vanity bag. I like that they've not gone for an obvious pink colour and for a gift set, the quality is actually surprisingly good (I'm going to be putting mine to good use as an everyday make up bag). 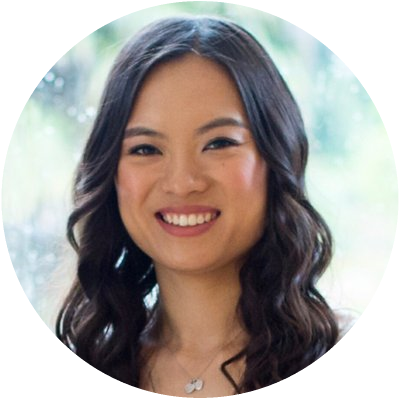 Inside you'll find 5 of their best selling products - Pro radiance cream cleanser, Pro collagen marine cream, Papaya enzyme peel, Skin nourishing shower cream and Frangipani monoi body oil. 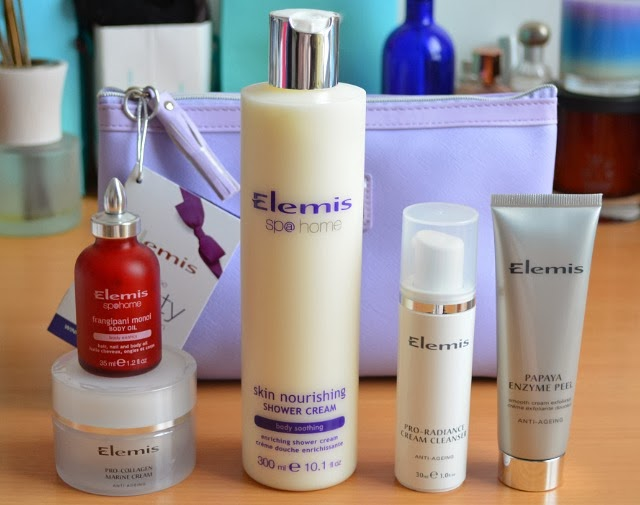 With this gift set, Elemis have gone back to basics, and chosen 5 products which could easily be incorporated into an everyday skincare routine, ensuring beautifully radiant and nourished skin whatever the occasion. The papaya enzyme peel in particular is well suited to most skin types and I love the sweet tropical scent of Frangipani monoi body oil. The only downside is that it solidifies at room temperature, however as it's super versatile and can be used on hair, body or nails, it's worth that little bit of effort just warming up beforehand. Although 3 of the products are minis, they're all generously sized and will last for a good few weeks. Perfect if like myself you hate trying out a new product only for it to run out after just 2 uses. Overall, a well thought skincare gift set, and with a retail price of £55 (saving £60 compared to the full RRP), a bit of a beauty bargain too. Are you a fan of Elemis products? What are your daily essentials? Diptyque have been on my wishlist of brands to try for quite some time now. With notes of vanilla, bergamot and pink pepper Diptyque duelle perfume sounds right up my street and with spring just around the corner, I'd love a refreshing citrus scented Oyedo candle for my room too. I'm late to the party but having tried By Terry baume de rose lip balm in Sephora I now fully get the hype. Think a thick emollient balm with just a hint of shimmer to moisturise and prettify natural daytime lips. Whilst on the subject of By Terry I've completely fallen for their new Cellularose blush glaces too. The Frozen petal shade in particular is just beautiful and the light gel texture means they're perfect for on the go application. On a make up related theme whilst browsing Out there interiors I couldn't help but fall for with this dressing table from their French furniture range . The simple but chic design will fit in well with my current decor and the 3 pull out drawers means there's plenty of space for make up storage too. Finally I love the idea of YSL glossy stains - a vibrant lipgloss which leaves behind a long lasting stain too. As someone who loves lipgloss but hates touching up, these would be perfect as I can just apply, then get on with my day without having to worry about my colour fading or smudging. Do you own any of these products? What's on your wishlist this February? As usual, it's turned out to be a real mix of every day essentials. Because my hair is so long at the moment, I seem to be going through shampoo and conditioner like crazy. In the last 2 months alone I've managed to get through 3 full sized bottles - all 3 are really good though and I would happily repurchase once I've gone through my current stash. The other haircare product was Batiste oriental dry shampoo. Although it did the job well it wasn't one of my favourite scents, in future I'd probably go for the Brunette version or one of their fruitier scents. Haircare aside, I was pleased to have finally finished Emma Hardie amazing face wash and Soap and glory greatest scrub of all. Both products seemed to be never ending and although I enjoyed using them (the Emma Hardie one in particular is really good), I'm keen to try something new. 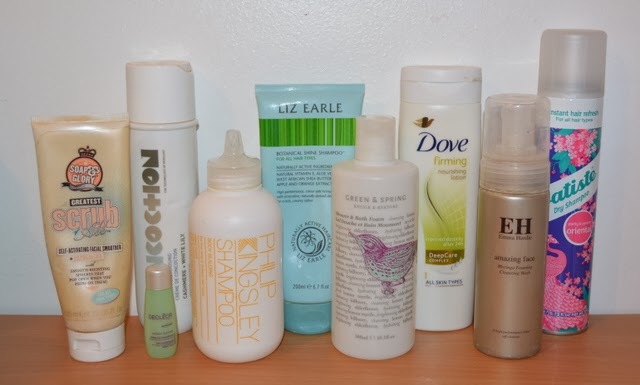 Please do let me know if you have any face wash recommendations for dry/combination skin. How did you get on this month? Which products do you find the hardest to use up?